There are physical adventures, there are mental adventures, and then there is ayahuasca: a relentless spiritual-physical-mental adventure that may be one of the most intense ordeals your soul can choose to experience in this life. If an ayahuasca ceremony is on your bucket list, you no longer have to go all the way to South America’s Amazon to reach your goal. Thanks to religious freedoms in the USA, you can finally check-off this list item, the ayahuasca ceremony, without leaving the USA. There are a handful of legal ceremonies popping up in urban areas and far-out locations in scattered pockets across the United States of America. According to our new section, the ayahuasca retreat directory, a Native American Church is offering ayahuasca in the United States for people interested in the sacramental ritual of an ayahuasca ceremony and the full-on spiritual practice of ayahuasca tea imbibing. It seems that the religious protections invoked by the religious freedom in America have made it possible — for people acting under the auspices of a church — to recruit new members to the church’s spiritual practices, where, as a potential member, you can partake in the ritual drinking of ayahuasca. In other ceremonies that take place in the USA, invoking religious freedoms, take the UDV, for example, where it’s typical for UDV ayahuasca sessions to include dancing all night, wearing pure white clothes, and singing Christian songs. That’s right, the UDV is Christian. During a ceremony you’ll be immersed in an alternative Christian world that — to outsiders, the uninitiated, fundamentalist, or bible pounding puritans — may seem like sacrilege. For the Native American church in Kentucky, you’ll have contact them to find out exactly what their ceremonies entail. This is the most unusual US ayahuasca experience to come across Heroic Adventures’ radar, and it happens to be located in the same state as one of North America’s most famous horse races, the Kentucky Derby. Yes, you read that correctly, Kentucky. Save the South American journey. Instead, buy your plane ticket to Kentucky. In all fairness, probably not everyone is as excited about an ayahuasca adventure in Kentucky as they would be taking the sacred medicine, say, with a Shipibo medicine man in South America — but, the novelty of the offer can’t be disputed. Imagine it, you can fly from New York City down to Kentucky in a weekend. After drinking ayahuasca and having a lifetime’s worth of spiritual bombardment entering your consciousness, you’ll be a new person when you go back to the office in New York on Monday. It’s time to take a Heroic Adventure not to the Amazon but to Kentucky. Compare the first photo from the Amazon, below, to the second photo of Kentucky, below, it would appear there is a spiritual connection between the two… Well, at least, they both have a lot of nice green plants. The Amazon isn’t the only place to legally ingest ayahuasca. Ceremonies are now emerging commercially in the United States of America. Looking a bit like the Amazon without the river, in Kentucky you can now legally drink ayahuasca with a Minister from a Native American Church. I’m not one to normally send feedback on posts, but this feels especially warranted. I appreciate you giving information to the public about Ayahuasca ceremonies being held in the U.S. I believe it’s a positive move forward that Americans will have Ayahuasca as a more accessible possibility. However, as someone who has experienced Ayahuasca, I really advise against saying things like “Imagine it, you can fly from New York City down to Kentucky in a weekend. After drinking ayahuasca and having a lifetime’s worth of spiritual bombardment entering your consciousness, you’ll be a new person when you go back to the office in New York on Monday.” That’s a very, very scary thing to advise people to do. When you take the medicine, it stays in your system for a much longer period than the one or two days you’ve actually consumed it. You need to have preparations in place for how you’re going to reintegrate into your daily life after the experience, and making it sound like it’s a “no big deal, let’s go do Ayahuasca this weekend” kind of thing is not only dangerous but it’s furthermore disrespectful toward and completely underestimating the power of the medicine. I’m not trying to be a heckler, but please understand that this is powerful stuff. For the sake of your readers, I hope you reconsider the phrasing of your post and add in how important it is to seriously consider whether they’re ready to take the medicine, as well as how important it is for them to do their research regarding preparations before and after the experience. In the Fall of 2015, a website popped up touting the First Ayahuasca Church in the USA that is open for ceremonies to anyone. Now this is a distinct organization front Mr Hupp (in the article above). 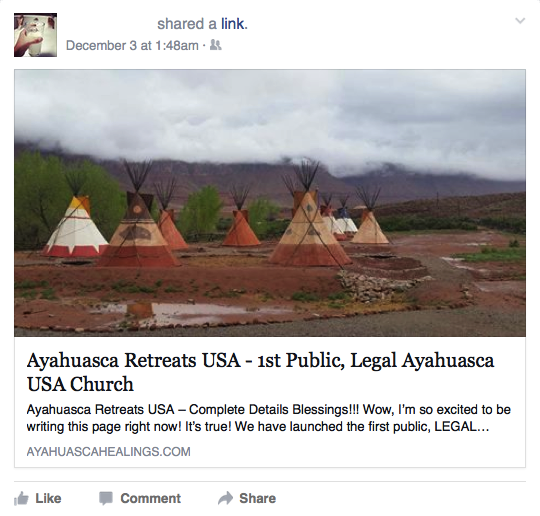 After this article was published detailing why this church is not legal–it seems the site went offline, maybe it will emerge again–for your own investigations–here is the link: https://ayahuascahealings.com. A curious story in the world of spirituality, religious rights, internet marketing, and law.